The following was received from Al Thomas, ETN3, '65-'67 and is his personal recollection of the Vietnam tour the ship took in 1966. Color photographs were contributed by Leo Rey, GM3. Shortly after I checked on board in November of 1965, the ship went down to Latin America with four other ships for HELICON VISTA. We went to about five Latin American countries that hadn't seen an American ship since WWI. While we were there, we operated with an aircraft carrier that almost suffered a collision with the BERRY. The officer who had the "con" (and I shall leave nameless) nearly rammed the carrier amidships and after a lecture from Captain Dermody was sent below and told not to come back until he had read his Annapolis books on the subject. This action by the captain endeared him to the crew for the rest of his command days aboard the ship. During this time the ship was fortunate to have a number of musicians and singers aboard and I was fortunate to be a member of this group. I could also speak Spanish and was one of the five ship's interpreters, the only enlisted member. When I reported to the FRED T. BERRY, she was designated an anti-submarine warfare ship and was assigned to DESRON 10. Shortly afterward she was reassigned to DESRON 12. 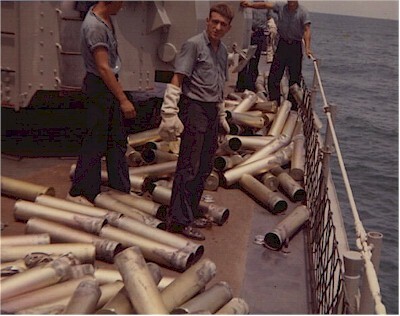 The ship contained special equipment that allowed us to be considered an anti-submarine destroyer. That equipment included special sonar, hedgehogs and an anti-submarine drone helicopter. The hedgehogs were located on the 01 Deck just forward of the bridge and replaced depth charges. 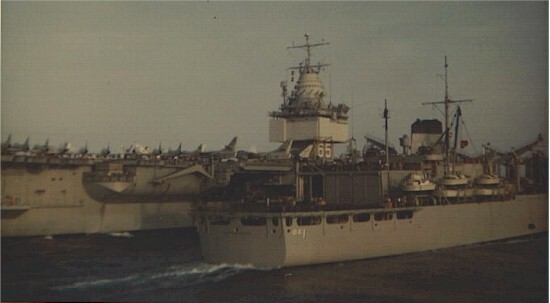 The helicopter landing area was located on the 01deck, just ahead of the Number Two five-inch mount. The hangar was located just ahead of the landing platform. During my tour we never used the helicopter and only fired the five-inch and fifty caliber guns. One reason we were transferred to DESRON 12 was to bring them up to full strength for their trip to Vietnam. Another reason was because the BERRY had earned three red hash marks for her three consecutive years of earning an Engineering Award. This indicated we had an outstanding engineering plant and we were a "lean, mean, steaming machine." They wanted a ship that did not have to be towed around the ocean, thus the transfer to DESRON 12. Before we left we took our electronic equipment over to the tender for calibration. After it was returned, they informed us that they thought our UHF communications equipment would be incapable of supporting us on a tour of Vietnam. I was then asked by the officers, "what are you going to do about it?" I asked them to have the CO to issue me a "Cash Chit" for the Boston Naval Surplus Yard. The captain obliged and we took a truck over to purchase and transport several small transmitters and receivers. The equipment we purchased was still new in the boxes. At this time there were several ships stationed at Newport, RI that couldn't get past the piers without having to be towed back. We were not one of them. Our crew consisted of fifteen officers and 273 enlisted men. I was an ETN3 when I arrived aboard. In my electronic gang there was an ET Chief Petty Officer, three ETR's and two of us ETN's. As you know, the "R" indicated radar and the "N" indicated communications. The Chief had never attended electronics school and had been made an Electronics Technician during WWII or Korea. As a result, he never worked on any of the equipment. The other ships in the squadron had three more ET's than we did. I can still remember the names of our gang. Since I had been advanced to ETN3 after completion of my electronics classes at Great Lakes, I was the lead working ET. Our CO was Commander Dermody. I believe he may be the one who is listed in the current ship's roster as living in Milwaukee. Our Division Officer was Ensign Leonhardt, and the Department head was Mr. Mulsberry. One day at sea we held a "Repel Boarders" drill (I believe). Anyway, I took the opportunity to throw all the empty electronics equipment cases over board, as that was part of the procedure during the real thing. Of course that was not the procedure during a drill, and our actions did not go over very well. We had planned it and waited for months to do it. The officers on the bridge were yelling, "stop, stop, it's only a drill," as we deep-sixed the large empty cases. We had actually saved the guts for spare parts. Before we went to Vietnam, we stopped in San Diego and received crews' air-conditioning. It was a large unit, installed on the after end of the ship, on the 01 level, over after crew's berthing. We were wearing our whites, with Navy peacoats, as we pulled into San Diego. After all, it was cold at sea and still winter in Newport when we left. By noon we were walking around the base carrying our coats. We were only in San Diego for a short time and not allowed to leave base. I believe it was in Subic Bay that we received port and starboard twin .50 caliber machine gun mounts on the after end of the ship. Platforms were welded directly on the deck so we could drop the .50 caliber guns into them. While out to sea, we test fired them. The First Class Gunners Mate allowed members of the crew to take a turn at the guns. I was very apprehensive, as I only weighed ninety-five pounds at the time. The kick is something I will never forget. 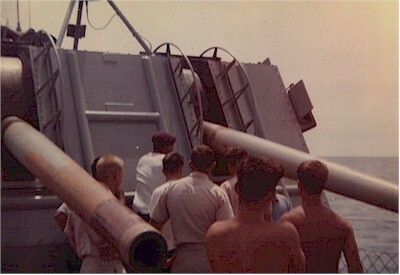 Upon our arrival in Vietnam, we relieved another ship while at sea and then went directly to the gun line. The ship we relieved was a new Guided Missile Frigate. They chose to play Anchors Aweigh on their loudspeakers as they made a turn, at flank speed, and headed home or "back to the world" as we Vietnam vets say. It was beautiful and made it difficult for many of us to hold back the tears as the whole ship manned the rail and watched that beautiful frigate peel off. We knew they were going home and we were just starting our tour. Before they left, the two CO's exchanged information by bullhorns, while running side by side. Our CO said "I relieve you" and their CO said, "I hereby stand relieved." Thus, we started our new duties on the gun line. On March 1, 1966 the BERRY commenced gunfire support operations on the III Corps. Area of Vietnam. At 1145 local time the BERRY began firing her 5"/38's against an enemy for the first time in her twenty years of service. Every morning we started earlier and earlier and our fire was directed by an Army pilot flying over the area. We used the Army walkie-talkies to start our communications with him and to verify they worked. One day we fired an anti-aircraft round instead of Willy Peter. The pilot ordered a cease-fire and called it a day because we had come close to blowing him out of the sky. Up until then, and even afterwards, he rated our fire support as outstanding. After our fire support he would supply us with body counts. He searched for ammo caches and V.C. using ammo trails. If he suspected an area he would fly right into it and draw their fire. Then he would direct our fire and fly back in it for verification that we took them out. On one occasion our spotter was shot down. We also did plane guard for the aircraft carrier USS ENTERPRISE (CVN-65). One day while working with the ENTERPRISE, she and the BERRY were called on a rescue mission for a group of Marines who were pinned down by V.C. We arrived on scene quite a while after the "Big E" and began immediate gun support. To do this, we had to go up the Saigon River. We arrived just as it was turning dark and asked the Marines to cease-fire so we could tell who was who. I went up to the bridge to listen to the traffic. We said to the Marine C.O. "it looks like you are surrounded." The Marine C.O. replied, "Yes, we know that. Why the hell do you think we called you?" After viewing the tracer rounds and getting our bearings, we began firing. The Marine C.O. told us to walk it into them as close as possible. The V.C. were right on top of them. We fired close to them, as he directed. Upon completion, we had opened up an escape route for them. We left the river about thirty minutes before low tide. To this day I have no idea what Marine unit that was. We were all glad that we were there for them and could still get out before low tide. On St. Patrick's Day we were standing off the gun line when a U.S. Coast Guard Swift boat called us and came along side for water and food, since they had been out of food for three days and their relief had broken down. Their C.O. was Irish and celebrating that day. He was wearing a green silk smoking jacket, a Green Beret cap and a green silk scarf around his neck. We gave them water, food and a few books to keep them entertained. They had a mortar up front and about four .50 caliber machine guns spread around the boat. They were so small and, next to us, they looked like one of our lifeboats. It was a neat, clean, heavily armed boat. We talked with their guys and ran below to give them some of our personal items. I remember it was hot, and one of the cooks even gave them a container of ice cream. The next day we heard a general Mayday from them. They were looking for any American ship in the area to assist them in tracking a Vietnamese junk. They knew we were in the area, and they had been following this junk all night. Their primary job was the search of junks and seizure of ammunition contraband. We could also do this when necessary. It was difficult to distinguish the target on the radar repeaters because it was close to shore and mixed in with the sea return, or grass, as it was called. Rick Wooley and I detuned the radar repeater filter out the grass. After making the necessary adjustments, we spotted the junk on radar and gave the bridge the bearing and distance. The radar men took over and continued relaying information to the bridge. Officers on the bridge relayed it to our Swift Boat until they pulled a visual contact and began closing in on them. Shortly afterward, my fellow radar ET and I went outside to get a visual on the junk and our Swift Boat. We observed the junk as it pulled back its thatched roof and fired one mortar round at our Swift Boat. The mortar made a direct hit and blew her completely apart, killing all on board. Our C.O. already had us at General Quarters and had the guns trained so he ordered one round fired from the forward mount and one round from the after mount. The first one hit the target, with the second right behind it. We then moved in closer to look for survivors but there weren't any. There was very little debris anywhere. The ship's crew was very grim for the rest of the day. From that day on we were more unified. We went from a mood of "this is just another cruise" to "it could have been us." On another beautiful, sunny day, as most were, we could see clearly for miles. At a distance I saw something causing small splashes in the water. The Vietcong were firing at us from shore but we were out of their range. Another sailor and I ran to the bridge and informed them in person, as there was no sound with the small, distant splashes. The splashes stopped, and without a spotter, we could not tell exactly where they were coming from. Since we were at G.Q., the ship continued to move farther out of range. Our Captain would take on anyone and do anything to return us home safely, while doing our duty. We all knew we had a great "Old Man." He was fair but didn't take any stuff. Periodically, we conducted sea refueling and replenishments. One day we received fuel from the tanker USS CHIPOLA, and I had the opportunity to holler at a friend who was stationed aboard. On other occasions we high lined for mail and movies. On one occasion we received an Admiral and a detachment of Marines. The next day we hit a severe storm, and the ship rode like a cork. Several of the ship's crew had fun making the Marines sick by telling them the different kinds of food they should eat. Marines usually served as gate guards at Navy bases and often gave us hard times leaving or returning to base. This was our turn to get even, and we did. For several weeks we served as plane guard for the carrier USS ENTERPRISE (CVN-65). Several times we rescued pilots after they ditched their planes at sea. We would then use our M14 rifles and .50 caliber machine guns to sink the external fuel tanks that would rise to the surface. On one occasion, after a firing mission, the ship's Yeoman walked past us to empty a trash can. As he leaned over the lifeline, it broke and he fell into the water. There were several of us standing there talking after coming off G.Q. We all began yelling "man overboard, port side." Since we had just come off General Quarters, there was a stack of lifejackets lying on the deck. We began throwing them at him for him to grab. The Conning Officer swung the ship around smartly, and we retrieved him with a lifeline. He was scared stiff because several days earlier we had seen sharks swimming in the same waters. Replenishing from the USS SACRAMENTO AOE-1, a Fast Combat Support Ship. The USS ENTERPRISE (CVN-65) was replenishing at the same time. At night the ship would sit still in the water or steam very slowly to conserve fuel. During this time we would set a guard on deck to prevent the Vietcong from sneaking aboard. After several weeks on the gun line the ship experienced problems with her five-inch guns. Three of the four guns experienced bulged barrels due to defective ammunition that had been stored since Korea. The gunners mates were able to return one gun to service and we then had one forward and one after gun able to shoot. Captain Dermody sent a message to the Squadron Commander stating "Have two guns, will travel." After a short period of firing, we lost one of the two guns and returned to Subic Bay for barrel replacement. We watched them use large shipyard cranes to unscrew and remove the defective barrels. We also learned the suspected cause of the bulging was defective powder in the five inch shells. As a result, we had to unload all the bad ammunition and reload new ammunition. You could actually see a large bloated spot in the barrels. We were probably lucky that one of the barrels didn't blow up while we were on the gun line. The BERRY departed Subic Bay in company with the USS ENTERPRISE (CVN-65), USS BAINBRIDGE (CGN-25) and USS MASSEY (DD-778), for operations on Yankee Station in the Tonkin Gulf. At a later date we escorted USS ORISKANY (CVA-34) during operations on Dixie Station in the South China Sea. On one day of gunfire support we fired 140 rounds of 5"/38 high explosives in the III Corps Area. A telling photograph of the aftermath of a day of shooting the five inch guns. Now the clean-up begins. The ship began its return to the United States in July 1966 and crossed the equator during its return. During the return to the States, there were several suicide attempts. I was on the "Man Overboard Team," which became somewhat of a challenge. One guy decided he was going to jump overboard in a Stage Six sea. This happened on the Captain's birthday, which he explained, in no uncertain terms, when he went to get some dry clothes. The Hospital Corpsman was also trying to talk to the guy with no success. He left giving me a chance to talk to him and apply some reverse psychology. I lined the rest of my team up behind me and told them to grab the guy after I undogged the hatch and leaned out to talk to him. I opened the hatch and told him to jump but we weren't coming in after him. I then closed and dogged the hatch down. In less than a minute I heard a light knocking on the hatch. I opened it about six inches, made a comment to the guy, then the other guys jumped on him. They had to leap past me and grab him. The Corpsman was beside himself after hearing of our rescue technique. I knew it was a calculated risk but it worked very well. They restrained him in his sick bay rack. I visited him once but couldn't go back again. The guy was probably the only crewmember who was smaller in stature than me. He looked pitiful, tied down in the rack but he was hand-fed and cared for by the Chief Corpsman. We got him to a hospital, and all was well aboard the BERRY once again. During this "around-the-world" cruise we visited Hawaii, Hong Kong, Vietnam, Yokosuka, Japan, Taiwan, Saudi Arabia, India, Malaya, Gibraltar, Greece and Palma, Majorca. In making this tour we had to transit both the Panama and Suez Canals. In one of the ports, Fred T. Berry, JR came aboard. He was a Navy Commander or Captain at the time. We set out the "Side Boys" and piped him aboard. It was a proud moment. We were luck because we conducted a seven-month, around-the-world cruise, including a tour of Vietnam, without suffering a single casualty. The Captain earned a Bronze Cross, for activity in Vietnam, or maybe it was for putting up with the crew. According to official Navy records, the FRED T. BERRY (DD-858) fired 1,533 rounds of 5"/38 explosive ammunition during her day and night missions on the gun line. Spotters also reported the BERRY had destroyed at least twenty-eight enemy structures and damaged seventy-three others. They also reported the BERRY'S accuracy was consistently outstanding. Upon completion of gunfire support operations, the BERRY provided plane guard for the USS ORISKANY (CVA-34) on Dixie Station. After this mission, the ship rejoined members of Destroyer Squadron 12 in Subic Bay and began its return home. On the night we returned to the states, the crew was granted liberty and several ran into some type of conflict. Some of us acted like we were overseas and went down to Shore Patrol Headquarters. The Chief on duty said they were looking for four or five other BERRY sailors and that we would probably be better off if we returned to the ship. We took his advice. Welcome Home. I left the BERRY after her return from Vietnam and did two patrols aboard the USS THOMAS JEFFERSON (SSBN-618), a Polaris submarine. My Navy tour had been so "interesting" that I couldn't stand any more. I chose not to re-enlist in the Navy after six and a half years.